This site is like a castle that began small and then in the course of time new halls and towers, annexes and break-throughs were build onto it, finally resulting in a castle just as beautiful as confusing. Now there is TONE, a tour through most of the highlights. There is a big story behind the highlights. In fact I developed a TOE, a Theory Of Everything. But since some questions remained, I call it a TONE, a Theory Of Nearly Everything - June 2017. “The story” and “The story part 2” contrive an interpretation of quantum mechanics that is the basis of this site. Nice to read. For people unfamiliar with the approach of this site, after “The Story” and “The Story part 2” these “Experiments” are the best introduction to the new interpretation of quantum mechanics used all over this site. This experiment shows clearly why my choice has fallen on a many world interpretation of quantum mechanics. The first half of this page gives the resemblances and differences of the interpretation with the Hugh Everett universe. A new interpretation of the inverse square law is suggested: The electric force is reciprocal to the number of worlds in interference. The second half of the page (starting from “There is one more peculiarity to view”) describes the propagation of the virtual photon when it meets and subsequently passes by an electric charge, taking into account spin. Experiment 4, an experiment that is meant to show the new interpretation is true. But it ends in a riddle. Also in the old interpretation, as far as I can see. Not a page to start with. Backward evolving time is worked out here. The first page is too wild, the second too classic. The mechanism of gravitation in backward-time direction. Argue the arrow of time is in gravity, starts from item 9 and 10. From item 11 the discussion picks up speed. In item 14 time reversed graviton and neutrino fields are discussed. Item 15 introduces backward-time evolving dark antimatter as a candidate causing Dark Energy. 7 WHAT IS A COUPLING? Your past, your present and your future fit to each other. The present is. If you succeed to change your future destiny you will have changed your past too. When you imagine an alien as real as can be, will the arisen perception - if existable - go in superposition with the real thing? Prepare to meet the alien. When this comes to existence, the world has just begun. A view on the future of humanity. I worked for decades on the electric force that is left over when an equal number of positive and negative electric charges is assembled to a convenient mix. The mix is a stable configuration. The force that is left over, is weaker than the electric force and is always attracting. I thought I found the origin of gravitation. This storyline is a remembrance to my younger years and a tribute to my efforts. 1 CAN WORLDS IN SUPERPOSITION SEE EACH OTHER? 2 DO THE CHARGES OF THE VACUUM REACT WITH EACH OTHER? One of the first results for QED that the new interpretation of quantum mechanics made clear, was the virtual electric charges of the vacuum do not see each other. This was not new in physics, but it was new to me. There is no remnant force between the virtual particles in QED. The search is terminated. Instead at this page is proposed a foundation on the Higgs field that prof. G. 't Hooft et al. so desperately needs in their renormalization theories. The photon is composed of an electron and a positron massless coinciding. The lepton vacuum is a Bose condensate of photons, yielding its own kind of gravitational field. Photons can be emitted in pairs. 3 DO THE CHARGES OF THE VACUUM REACT WITH EACH OTHER? A recipe for a better QCD and a primitive attempt to a color net force. In this storyline colors are replaced by quaternions. The color product end state of red, green and blue, and also of cyan, magenta and yellow, equals +1 (white) or -1 (black), both are colorless states. The color sum end state of red, green and blue, and also of cyan, magenta and yellow, equals zero. Multiplication order is not to be interpreted as time order of occurrence. Quarks with color i and j can swap color but one of the colors changes sign. Glu3ons are massive and have range. Is this mechanism candidate for the next generation? In this page quaternions are replaced by 2x2 matrices. It turns out the product of 2 Pauli matrices always yields a quaternion unit. Dark multiplication rules. Eight independent gluons reduced to six independent fields by means of the so-called color-shift. The last paragraph treats mesons and introduces colorshift 1/6. But the colorshift approach is abandoned, colors are replaced by quaternions now. In quaternions black glueballs are a candidate for dark matter. When particles absorb mass from the Higgs field and antiparticles emit to the Higgs field, a gluon can consist of two quarks, massless coinciding. The vacuum can be made of spin 0 gluons directly. Colored spin 1 gluons can originate from 4 quarks all within their time borders. Colored gluons appear in pairs. The typical strong force reaction time is calculated to be about 0.5 * 10^-24 s. Gluon-gluon coupling times are unimportant, they take no time at all from our spacetime. Color follows closed paths. Bound states of gluons. Three gluons merge easier than two. 8 DO LARGER NUMBERS OF N COUNT? The new interpretation of quantum mechanics yields a perfect explanation for color confinement. But the new law that is used to get it seems not appropriate here. Did I put the right puzzle pieces in the wrong way? GlueNballs of higher N must superpose to gravitation. And a recipe for a better QCD. A theory of gravitation. The vacuum is proposed as a liquid that drags along with it all matter floating in it. This dragging is the force of gravity, and the expansion of the universe as well. The vacuum is proposed as a liquid bose condensate. If a tiny amount of space disappears along with mass absorption from the Higgs field and if “a velocity can be put in a box”, then the Newton law of gravitation follows directly, except for the constant. The GR equations are right, but the curvature is an optical illusion. Rearranging of vacuum marbles always returns to flat Minkowski space. Is this principle a candidate for the observed ZERO OVERALL CURVATURE of space? Every wavefunction consists of an infinite set of elements. A coupling is presented as a different, indistinguishable choice out of the same sets of elements. But a supply from the Higgs field is needed. The structure of the vacuum. The vacuum marbles are filled in with gluons. Colors are quaternion units. The vacuum consists of color pairs ( i -i ), ( j -j ), ( k -k ), ( 1 1 ). Backward time evolving vacuum consists of ( i -i ), ( j -j ), ( k -k ), ( -1 -1 ). The essence of time is in the hadronic vacuum. Sole color cannot be given mass. Two gluons of opposite sign do not react. If you have two Pauli matrices in multiplication, then changing multiplication order is the same as changing multiplication rules (from bright to dark, or from dark to bright). The mass of the color -1 state. Backward time evolving dark antimatter galaxies cause the expansion of the universe. A first effort to formulate the laws of dark mechanics, ruling backward time evolving matter. Backward time evolving matter as candidate for the DARK ENERGY. Black glueballs as candidate for DARK MATTER - in quaternions only. The photon proposed as an electron and a positron, massless coinciding. A huge matter-antimatter explosion is candidate for the BIG BANG. A small excess of antimatter over matter is candidate for the observed ACCELERATED EXPANSION of the universe. When one regards the light of stars as a photon bath the paradox is solved. The past is fixed and your destiny is set. But seldom is realised every event that had ever happened is still happening and every event that will ever happen is already happening there, somewhere along the 4th dimension. 5 NO PAST. NO FUTURE. If more-dimensional spaces, highly curved spaces and expanding spaces yield identical observations of the matter they contain, then those spaces are indistinguishable and will go in superposition. When nanogrids can enter a brain cell without disturbing its function, we cross a threshold. A view on the future of humanity. 2 WILL A NANOGRID EVER BE ABLE TO SIMULATE THE CELL IT IS IN? Electricity conducting magnetic dust forms a floating circle, a floating ring. The magnetic field of a current running through the circle is used to push ions to one side of the stalk. One can report incorrect representations. Push the Prt Scr button on your keyboard and do CTRL-V in a program like Paint or Word. Save the picture and send it to me. 1 CAN AN INFINITE AMOUNT OF INFORMATION BE STORED IN ONE SINGLE FINIT NUMBER? In earlier times FRITS JONKER wrote this inspiring piece on data-compression by prime numbers (despite its low base on math). In remembrance to Jan Sloot, who invented a compression technique, kept it a secret and then died, there is a last secret page at the end of the series. There is a hidden number giving access to an empty page. Select the page and read. The surface of the sphere derived in simple steps only. Geometry as it is meant to be. Pop-up frame with the most basic quaternion calculation rules. The general theorem of evolution, struggle for live and survival of the fittest, has a general extension, leading to an ecology. A brain part copied from person to person, from neurons to neurons, and its consequences. About crop circles. Although mainly an exercise in electromagnetism, crop IS biology. Spread over this site there are some other remarks on biology. There are some in the popup frame UPDATE from CROPCIRCLES BY ELECTRIC AND MAGNETIC FIELDS. There is one about life in page 6 of FORWARD BACKWARD TIME DIRECTION. A row of pages is called a storyline. Buttons of one storyline have same color and navigate along that line. 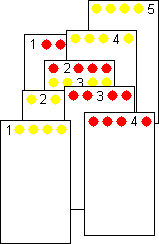 A page where two rows of buttons appear is an intersection point of those two storylines. Intersection points have blue chapter numbers in the Leandra Physics Contents.